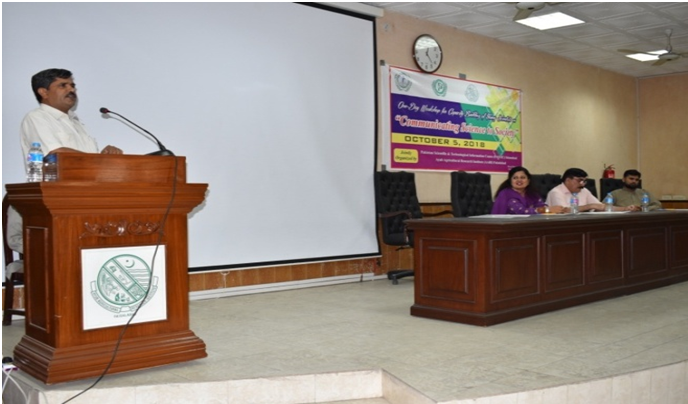 A workshop/seminar on “Capacity Building of Young Scientists on Communication Science to Society” was organized by PASTIC Sub-centre Faisalabad on October 05, 2018 at the main the Library of AARI. The detail presentation of PASTIC Services through PASTIC web was delivered. by Mr. Muhammad Hasnain. 130 participants, directors and senior scientists participated in the seminar. The resource persons were Ms. Huma Qamar, Ayub Agricultural Research Institute Faisalabad and Dr. Salma Umbar, Chairperson Department of Mass Communication GCU Faisalabad. They discussed the issues relevant to the topic, and shared their expertise. The Chief Guest, Dr. Abid Mehmood, Director General AARI, appreciated PASTIC activities and efforts. He explained the objectives of this session, and emphasized the role of all forms of media i.e. print, electronic and social media to consider science as their priority for the benefit of the society. Deputy Director (STI) addressing the participants at AARI.